"Sometimes being a friend means mastering the art of timing. time to prepare to pick up the pieces when it's all over." Have you had a natural birth? Do you have actual (and strong) opinions about things like vaccines and circumcision? Do you find yourself cornering newly pregnant women whom you have never met at social functions and dumping information on them when they mention that they want an episiotomy because "it just heals up so much better when it is a straight cut than a jagged tear"? Now- what do you do when somebody-- maybe even somebody you love, appears to be heading down the birth trauma highway? Ahh, the humanity! Knowing that your friend/sister/neighbor/in-law is being set up for a horrid birth experience! 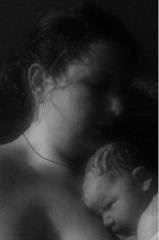 How hard is this for the natural birth mama who simply loved her life changing birth experience? Do you keep your mouth shut? Do you offer information? Do you share your experience? Can you "let" her go down a path you don't think she should? "My friend is being set for an induction at 39 weeks because she is uncomfortable. What research can I give her?" Or, as a natural birth teacher I get phone calls from the mom or mother in law or buddy trying to enroll their loved one in a natural birth class. "I LOVED my natural birth! She really needs this birth class. When does the next one start?!" As a woman who has actually uttered the words "You didn't need that c-section" (yes I am that tactless), I can honestly say that this is a very difficult one. 1) What you consider a good experience might not be what somebody else considers a good birth experience. "Ahh- you wonderful woman! Thank you for your wisdom! I now see that maybe, just maybe, I too am capable of vaginal birth. You have given me hope!" This is NOT what she said. Instead she looked at me with a little bit of horror and said something about how she couldn't believe I would want to go through that. What was an empowering experience for ME just sounded exhausting and brutal to HER. She has scheduled her c-sections for her other babies, and I believe been quite happy with her births. I can only imagine that my most recent unassisted birth in my bed would have sounded equally awful to her. So- to each his own. We don't all want the same thing from life or from birth. 2) If you are known for your alternative birthing choices- people who are interested will ASK. Realistically, the vast majority of women birth in hospitals with epidurals and pitocin. If you DON'T do this you are very different. People will talk about it. Maybe not in front of you, but they will hear about you. And when somebody feels like they are unsatisfied with the care that they are getting from their assembly line, five minutes, "who are you again?" OB, they just might take the time to ask you what you think. You heard me right- they will come to YOU. You don't need to corner them at a bar-b-Que. You don't need to give them thirty books to read. You don't even need to roll your eyes about their birth choices. This doesn't always happen in a "so I heard you had a natural birth, I want one too" kind of way. It just happens among FRIENDS when they TALK like regular people. I also remember chatting with a friend while our kids played. She asked me about my births. I think I had two children at the time, one in hospital and one at a birth center. She had a typical but not upsetting hospital birth with an epidural an some other stuff thrown in. She did however feel like birth could be something more. When she got pregnant she asked about who would be a good natural friendly OB in town. Then when she was ready she asked who would be a good home birth midwife. She changed care providers and never looked back. She RAVED about midwifery care. I got to be at the birth of her second child ... in her bedroom. Now she is a huge supporter of natural and home birth- and I never even told her what to do. I just answered her questions and shared my good experiences and she made her own choices. She already wanted to make them. She just needed somebody to say it was OK. Then she had a home birth before I did! People will come to you when they see that you found joy in your experience. 3) Some people just are not interested until AFTER a bad experience. This might be the hardest part. Especially if you see somebody taking the same path that you took and you know how much pain it caused you. We naturally want to "save" or "fix" or "help" somebody avoid pain. You CAN talk about your good experience. You can gently offer information, links, books, and things like that. If you are really friends with somebody, you will know what is appropriate and what is offensive to offer to that person. But no matter what you do, some people just don't care- until things go wrong for them. Sadly, sometimes that is what it takes to question an entire culture of mechanical birth. We may desperately want to save somebody else from what we perceive to be a bad choice for them- but it is still THEIR CHOICE, and a very personal one at that. Maybe you wish somebody had opened your eyes then to what you know now- if so, then offer in the way it would have worked for you. But remember that there is a possibility that you wouldn't have listened either. Remember that part of YOUR journey was pain. Maybe that is what makes you so passionate. Maybe that is part of your friend's journey too, no matter how hard it may be to step back and watch. Be kind, be loving, be there, be a source of information, and then, be a good enough friend to let go and respect their choices. Remember that your different choices don't necessarily make you better either. I want to close again with the quote at the beginning of the post. The only thing I would add to that - is remember that nobody likes an "I told you so" after their bad experience. It might even be a great experience for them. Yes, even if you disagree with the choice, your idea of a good birth is not what everybody else's is! Assuming that our birth choices are the "best" across the board is a judgment in an of itself. We all get to make our own choices, and true friends are the ones who still love each other even when those choices are different. What I want in a true friend is somebody who loves me no matter what, even if we disagree. The truth is you can't "let" anybody have any kind of birth. It was never up to you. Lovely post, I couldn't agree more. Oh mama - you wrote this one for me! I printed it out to keep with me and remind me (especially on my journey as a doula) that my ideal birth is not the same for everyone. Thank you for giving me the gentle reminder that I need! Very timely. I have a friend whose first birth was an emergency c-section and whose OB and husband is now pushing her to an ERCS. Her OB seems to be giving her *really* low odds of a successful vaginal birth. I don't know how to present other stats without seeming confrontational or unsupportive. wow. amazingly awesome post. I so needed this, thank you. This is all so true. As a Bradley mother and a Bradley teacher, I want everyone to be able to birth naturally. But I've had to sit back, with mouth firmly closed, and allow my own daughters-in-law give birth to my grandchildren with the full complement of medicalized procedures, short of c-section. They did not ask for my opinion, and I didn't offer it. They knew my beliefs. But they made the choices they were comfortable with. I can't insist that they do anything other than that. My daughter did ask me to teach them Bradley and be their doula. We had a wonderful, wonderful time. Great post! Very well written. Thanks Sarah! Great post!! I have learned to keep my mouth shut and speak kindly to all of my pregnant friends! Great post. So true! Sometimes I have to remind myself, "It's not MY birth!" Well said! I am sharing it over on The Happy Womb.com FB page. Was led here via Lucy at Dreaming Aloud. Fab fab fab!!! I am Doula training at the mo and have four children, it is so good to be reminded to take your own ego and desires out of the picture when it comes to really supporting others. So glad I swung by here. I needed that so much. Thank you! This is something I really needed to read. I had an unassisted birth in June, and I find myself trying to reach out to every pregnant woman I meet. I would not try to push unassisted birth on anyone (I myself thought it preposterous the first time I heard about it) but I do try to educate them on birth interventions. I tend to judge women who have a birth full of interventions, and shake my head at their choices. I need to remember that, like you said, not every woman has the same belief on what an ideal birth experience is. Thank you. I have been thinking about this blog since I first read it early in the week. This situation is very real to me right now and has been several times in the past and have always taken the quiet approach. I've remained silent and at most said that I really researched my choice to have a completely natural birth free from medical intervention. I have begun to wonder if this is indeed the right path? My birth choices were not made lightly and were made with both my health and the health of my babies in mind. I truly believe that some medical interventions are harmful to moms, babies and especially their relationship. Is it right to stay quiet when you think the path isn't so much about equally good choices but really about doing harm? I've started to feel this way about breastfeeding as well. I know this may not be a popular stance but I think if society made not breastfeeding as taboo as say not using a car seat more moms would stick it out when things get a little tough. Again, we are truly doing harm to our children by not breastfeeding. Yet we are careful not to criticize when a mom says "she just couldn't". I wonder if those of us on this side of the argument are a little too concerned with respecting others' CHOICES????? I just don't think people listen unless they want to. It isn't just about choices- it is about the reality of people and how people learn. Most DO NOT learn by somebody telling them what to do- that just makes people defensive. I think you are right and I post along those lines sometimes- but guess what- it turns more people off than it helps. Breastfeeding is a great example- those who call themselves lactivists routinely give breastfeeding mothers a negative connotation with their forcefulness. The sad truth is- people are allowed to hurt their own children to some degree- but this includes you and me too. Certainly people believe it is dangerous to my children that I home birth- guess what - it is my choice- just like others have theirs. I really needed this post. I find it so difficult to sit back and not speak out when I have ANOTHER friend planning a scheduled c-section, or hearing about how my mother-in-law decided to get induced after a routine prenatal visit just because she wanted her baby to have the same birthday as someone she knew. It's not even just about birth, either. I've felt almost suffocated when I see my friends refuse to breastfeed or give up within a day and then watch their baby suffer with constant vomiting because they just can't handle the formula. Or people who let their newborn babies cry it out because "they have to learn". I just want to scream, "They've been attached to you for 9 months and it's only been a few weeks since birth!! Pick up your baby and love them!" Simply put, everyone is different. They do not feel the same way as I do, and they think I'm just as crazy for breastfeeding, co-sleeping, cloth diapering and freebirthing. I learned the hard way too. Of course when people ask, I tell them. I was in the hospital for a posterior vaginal repair (I know about the Whole Woman site, I chose to go surgical, I don't regret it for a minute) the nurse asked me how the labours with my kids went. Part of the whole curiosity thing because I was on the post partum/OB/GYN surgical ward. I told her "had em both at home...not like I would have made it to the hospital with either one, had em both under 90mins..was lucky my midwives made it in time" And that's exactly how I answer any and all questions pertaining to my labours. If they want me to expand I will. If not it's short n sweet and to the point. After a scheduled C section (trauma! ), a failed home birth ending in a 2nd C section, and FINALLY a successful hospital VBAC, I feel like I know a whole lot now and I get tempted to corner that pregnant lady at the BBQ. But if there is one thing I learned from it all is that yes - it is a tremendously personal choice and certainly not an easy one to make. i can't reconcile this wonderful post with other things you've posted (specifically, the rant against epidurals). My sister is scheduled for an induction the day of her EDD (less than two weeks away) and I am so scared for her. I was induced with my daughter almost 19mos ago and she was present in my L&D room and knows how rough of an experience it was. It honestly scared her to watch me labor. It's so hard to believe that she is choosing to go down that same path just for the convenience of scheduling. I know I need to step back and respect her choice just as I hope to be respected in my choice of a home birth this coming October. I actually lost a good friend of mine because of this. I was going for my vbac and she was a first time mom who had a scheduled c-section for "big baby." I gave her so much info and she didn't care and went ahead with her c-section at 37 weeks. She thought it was great and is so excited about her repeat in November. We rarely talk anymore though, and it's mainly because I think I really turned her off with all my birth info. That and it's still really hard for me to comprehend why anyone would happily put themselves through another c-section without even trying for a vbac. It's just safer for me not to ask her about her pregnancy and say something else to distance her even more. Yes, I totally agree with this article. I had a hospital birth that was not the worst but also not the greatest. I have four children and after my first birth I wanted a more natural experience. I had my three last kids at a birthing center which was pretty much a home, and have never looked back. It was the best thing that has happened for me and my family. I have found from experience also that when you tell someone of your birthing experience they choose either to explore it or not, either out of fear or purely it was just not for them. We can not force our thoughts and beliefs on people but rather show them love and guidance and help them to make the best decision for them.